Paul also becomes involved in a wild cult-like group who go to extremes to make their dogs talk like humans. This cult does horrible things one would never think of doing to a dog physically to get them to talk...like having surgery performed on their jaws and other monstrosities. I love this book because it is unpredictable and the plot is unique. I've never read a book quite like The Dogs of Babel, and I have sought out all of Parkhurst's other novels since. The book will have you glued to it from start to finish. 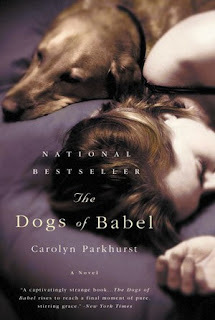 When all is said and done, The Dogs of Babel leaves a lasting impression on readers; combining romance, tragedy, and horror in one well-written novel by Carolyn Parkhurst.